animal unemployment circus animals elephants ringling bros. In response to increasing public concerns about the treatment of performing animals, the parent company of the world-famous Ringling Bros. and Barnum & Bailey Circus has announced that it will cease using elephants in its shows by 2018. Feld Entertainment, which also runs family-friendly shows like Marvel Universe Live and Disney on Ice, has previously defended the treatment of circus animals and operates a Center for Elephant Conservation in the Ringling Bros. name. But the company tells the AP that it will no longer use the large mammals after the current crop retires. 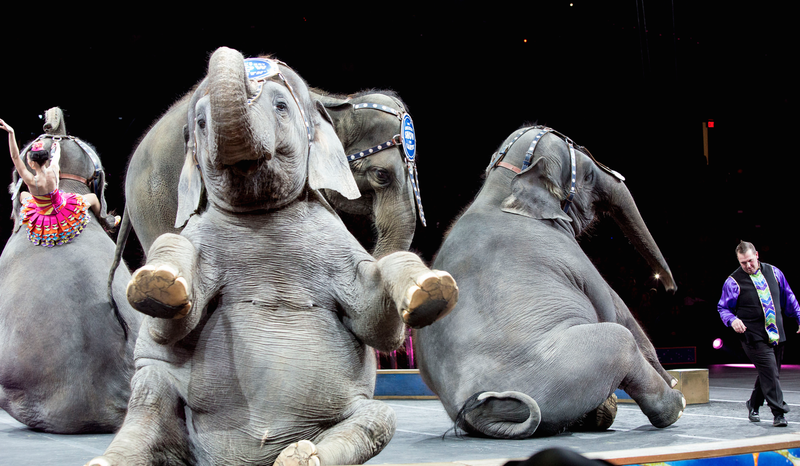 The decision to phase out elephant performers is not just about audience concerns. There are also a growing number of local governments that restrict the use of circus animals. It is easier for Ringling to drop the elephants altogether than try to fight or abide by varying local ordinances, explains Feld president Kenneth Feld. There are currently 13 touring Ringling elephants. When they retire, they’ll join the 30 others at the conservation center in central Florida. As of now, that center is not accessible to the public. That could change as the company looks for ways to subsidize the $65,000/year cost for each elephant in its care.